Hello GATE 2019 Aspirants ! GATE exam is just a few days away, so Geeksforgeeks is here to help you gauge your GATE preparation and guide you through this crucial time. Clearing the competitive exams like GATE with flying colors demands good preparation and daily practice. 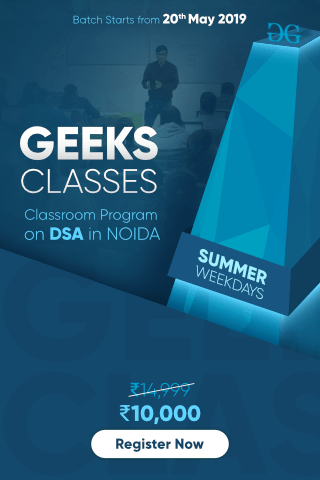 Geeskforgeeks has been there to help in your GATE preparation with our GATE Notes and Sudo GATE course, now let us help you through your practice phase. You must have heard this phrase, “Practice makes a man perfect“. But remember, to land between top GATE AIR, one needs to practice in the right direction, the right way. In this situation, the best way to practice is through MOCK TESTs. Taking Mock Tests can bring some drastic improvement in your AIR and will also help you set the strategy for GATE exam. Mock test will not only help you to know the strong/weak topics but can also help you minimize the time-wastage and overcome exam fear. Therefore, we highly recommend you to attempt Geeksforgeeks Mock Tests scheduled from 21-Jan to 25-jan.
Geeksforgeeks has specially designed two Mock Tests(Mock Test-I and Mock Test-II), considering the pattern and syllabus of GATE exam. The quality of questions in the test is ensured to resemble with GATE and will also help you improve the problem-solving skill. Help in last time revision: The preparation phase is almost over and now it’s time to let the GATE exam examine your knowledge. 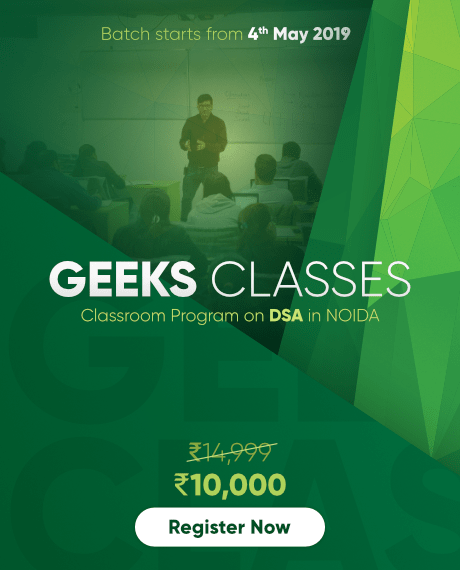 Geeksoforgeeks Mock tests cover the whole GATE syllabus, so it will help you to recall the concepts while solving the paper. Also, it will help you to analyze some of your weak concepts. Analyze your strength and weakness; plan accordingly: Mock tests help you to analyze your strong as well as weak topics. You can accordingly use this precious time and brush-up the topics. It’s like getting one extra chance: While giving the Mock test, you might come up with a topic which you didn’t learn, but still lies in syllabus, or you slightly remember a topic but not able to recall while solving, or you might be nervous while solving the paper. These are some unexpected things which can put you under pressure. So Mock test gives you strength to perform well under such situations. Proper Time Management: Managing time is a very crucial thing. The duration of mock test is usually same as the original paper, so you can learn how to manage time. Like how much time should one put on some certain question/section; thing like these will get clear once you attempt the mock tests and this will certainly help you to save time in GATE paper. Bost your confidence: Mock test give the feel of real exam. If any aspirant is giving GATE for first time, mock test will be like a qualifier for them and also help in reducing pre-exam jitters. Take mock seriously: Mock test can be considered as a trailer before the film, means, it will give you a whole idea about the GATE exam. Say it the time management, or overcoming the silly mistakes in paper. So, one should take mock test as seriously as the real exam. How to attempt GATE paper: We can always learn from mistakes, and it is always better if we do. Mock test gives the idea about the real exam and help you decide your strategy in GATE paper, so it is always recommended to solve more than one mock test. Paper is perfect for no-body: Remember, paper is perfect for no-body. Never try to solve the complete paper, because no-body can and that’s the beauty of competitive exams, face it. Answer the question you are completely sure about, else your AIR might go down. Even the year topper will not attempt the complete paper. Give mock in your paper time: Giving the mock test at the same time your paper is scheduled can help you in some way. Research says that following such strategy can help to reduce the exam jitters and makes your mind and body ready for the exam. Approach to attempt the paper: While giving the exam, sometimes so happens that we stuck in one question for a long time, and later you don’t get time to attempt the questions you could solve easily. Or, you should have solved some particular section of paper you were very confident about, but no time is remaining now. Mock test will take all those silly mistakes and make you better for the real exam. We hope above points will help you in the practice phase. 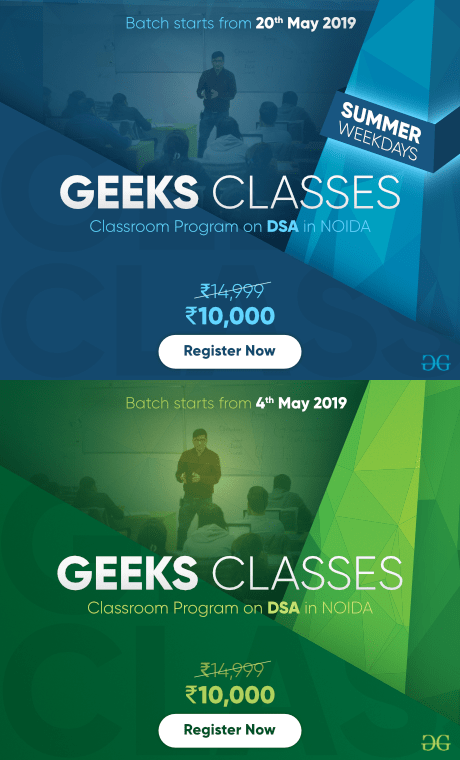 Geeksforgeeks wishes all GATE 2019 aspirants ALL THE BEST.